In the distant future, corporations have become sustainable communities with their own militaries, and corporate goals have essentially replaced political ideology. On a youthful, rebellious impulse, Lawrence joined the military of a corporation that he now recognizes to be ruthless and exploitative. His only hope for escape is to earn enough money to buy his place in a better corporation. When his platoon is sent to a distant colony to quell a local resistance effort, it seems like a stroke of amazing fortune, and Lawrence plans to rob the colony of their fabled gemstone, the Fallen Dragon, to get the money he needs. 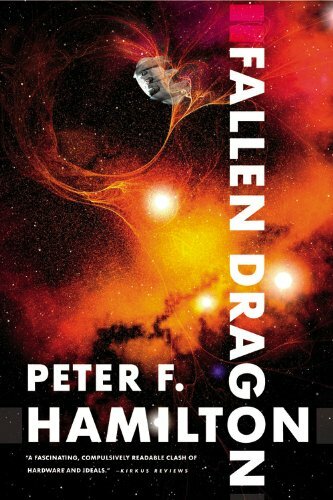 However, he soon discovers that the Fallen Dragon is not a gemstone at all, but an alien life form that the local colonists have been protecting since it crashed in their area. Now, Lawrence has to decide if he will steal the alien to exploit the use of its inherent biotechnical processes -- which far exceed anything humans are capable of -- or if he will help the Resistance get the alien home.